Everywhen brings the action and adventure of the Barbarians of Lemuria (BoL:ME) roleplaying system to all times and places! Everywhen is a standalone game based on BoL:ME and contains expanded rules for vehicles, chases, mass battles, investigations, social conflicts, psionics suitable for any campaign, and allows GMs and players to get going immediately with their own settings or using one of the provided example settings. 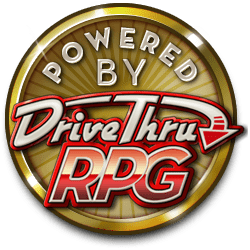 Visit the wiki for an overview of the game mechanics and form fillable character sheets (everywhenrpg.wikidot.com). Note: Both the softcover and hardcover PoDs have black and white interior art. "Colour books" have been used for heavier paper and improved image quality. Eleven ratings @ four-point-five avg. with zero reviews and, thus, no verifieds. Is this DTRPG, or Amazon? Chill, dude. You have to buy it to rate it. I'm not unchilled "dude"; what does one thing have to do with the other/relevance? If anything, you're only reinforcing my point. TL;DR- 1. I am. 2. So what? Every person who leaves a star rating has bought it. Drivethru customers are very lackadaisical about leaving reviews. The rate hovers at between 1 and 3 percent. Around one in ten people who leave stars leave an actual review. If you're talking about Drivethru's Verified Reviewers (as opposed to verified purchasers) that program is largely abandoned. Those 39 people get deluged with too kuch stuff to review it all, and I haven't seen a new review from any of them in a long time. I doubt this publisher is scamming anyone. Electric Rating is like 250 to 500 sales. I would guess they're on the low end. I don't think this product was ever a top seller on the charts. Speed of sales also greatly increases the chances of people leaving reviews. Hi Todd, I'm guessing that's a rhetorical question? If I can help in any other way please ask. Seems Moonreader+ has a fair bit of issues reading this pdf? On account of it crashes the app on my tablet and phone. It's fairly slow on other apps too, like multiple seconds to turn a page. Anything you guys can do about this? A version without backgrounds has been uploaded, please see if this helps. Hi Phil, Thanks for getting back to me. But I am sad to say that this didn't solve the problem. Does it work with other readers? It does, but it's rather slow. Which may be on the readers in question. It's one of the reasons I prefer Moon+Reader. Works fine on pc of course, but that's not an ideal situation. Currently waiting on the delivery of the proof. I never got a discount code after buying the pdf before it was available. Can I get it? Sorry, the discount code is no longer available, it was for one month from the PoD being released. Huge fan of BoL, I bought Everywhen and love it mostly. Sadly, It do not resolve the issue of long term campaign as there are not so much room for improvement. A companion with dedicated rules for flavor (Fantasy, Cybernetics, Galactic, Urban Fantasy, Pulp Horror) would be appreciated. Do you have some news about the PoD ? Not a huge fan if the Scaling up/down rules and the new way of doing Lifeblood. On the one hand I like the sort of White Wolf way of making non lethal damage actually matter by catching up but it seems a teeny bit clunky for why I would play BoL. I'll read more for sure but just a first impression. The "Inventor" rules are still looking kind of less than what I was hoping for. Just sort of ho hum and then marginally over powered, mostly from the ignore all non invented stuff clause and the like. But just a feeling more than from experiences. Also don't call it Credit Rating. It is both kind of weird and sort of silly sounding imho. Just call it Wealth or something. I would have preferred an actual system of buying and selling with prices or the like as another optional set of rules but it isnt hard to make up. So its great to see a Wealth system option at all. Still as much as I dont like a few things Im still super happy to see BoL still kicking and doing...See more new things. Anything a play group doesnt like is easy to change. Such a great game. Though I would have loved to see even more optional rules thrown around. Tons more. More psionics and lots more pre-written Spells too please. This is excellent! Thank you for producing this setting neutral BoL! When can we expect a PoD? Glad you like it. The PoD files will be sent off this weekend, so as soon as they're accepted and the proofs are approved. Did you mean to post a blank message? Thank you for posting a change log with the updates, I really appreciate that. Looks really good. Not sure I like the scale system! Seems complicated with the mix of books and adds/minuses to damage. Think it will work best with same scale conflicts rather than supers! How much work would this require to do superheroes? Everywhen uses the concept of scale to allow characters and/or vehicles to use the same rules whilst having vast differences in abilities/attributes, So the Hulk might have Strength scale 4. Boons and flaws can also be scaled allowing the likes of Iron Skin - causing all attacks to be scaled down by one. So, yes, it should work with Superheroes, however the GM would need to do some work, creating appropriate boons and flaws. A little bit more of information would be nice. Is this stand alone? Yes it's a stand alone game, although some work may be required from the GM depending on what setting they wish to run.